It seems to be predicated on the belief that low interest rates leads to companies borrowing more to expand, increasing employment, which leads to labor shortages, which leads to higher pay for workers, which raises the cost of goods. This seems like a rather indirect and roundabout effect, which does not bear much relationship to the current economy. So far as I can see the price of goods is determined mainly by how monopolistic the market it, which is determined more by mergers and acquisitions than anything else. When interest rates are high, leveraged buyouts result in enormous debt burdens, which get translate to increased prices—the opposite of the low-interest leading to inflation prediction. I think that problem is that prices today are more determined by the cost of capital and corporate profit taking than by the cost of labor, but the economic models reported on in the popular press are stuck in the 40s and 50s. Perhaps someone who understands economics better than I do could show me how the models work, and back it up with recent data? Faculty at UCSC are required to write “learning outcomes” for any new course they want to teach, and these outcomes are vetted by the Committee on Courses of Instruction, as part of the approval process for new or revised courses. I was on that committee for a couple of years, and most of the learning outcomes I saw were vague, generic statements about students understanding the content of the course—a rather useless expression, as “understanding” is not a measurable concept. For memorize-and-regurgitate courses, there may not be any learning outcome beyond “knowing” a set of facts, but I would not want to teach such a course, nor am I aware of good ways to determine what students know. Another common set of learning outcomes were very vague statements about reading, writing, or thinking that could be applied to almost any course at the university—general statements of desired outcomes of a university education, with no specific relationship to the course. A good learning outcome should be something observable, not something internal to the student, even if what we are attempting to achieve is indeed an internal change of state, and a good learning outcome should be specific to a particular course (and perhaps even to a handful of assignments in the course). The hard part is coming up with good, observable proxies for the real learning we want students to acquire. For my applied electronics course, I have a lot of different goals for students: to think like engineers, to work together effectively, to meet deadlines, to write well, to design and debug, … . But listing these broader goals as learning outcomes would be too vague, as they do not define what this particular course is doing, nor do they provide ways to measure whether they have been achieved. draw useful block diagrams for amplifier design. use simple hand tools (screwdriver, flush cutters, wire strippers, multimeter, micrometer, calipers, … ). hand solder through-hole parts and SOT-23 surface-mount parts. use USB-controlled oscilloscope, function generator, and power supply. use python, gnuplot, PteroDAQ data acquisition system, and Waveforms on own computer. do computations involving impedance using complex numbers. design single-stage high-pass, band-pass, and low-pass RC filters. measure impedance as function of frequency. design, build, and debug simple op-amp-based amplifiers. draw schematics using computer-aided design tools. write design reports using LaTeX and BibTeX. 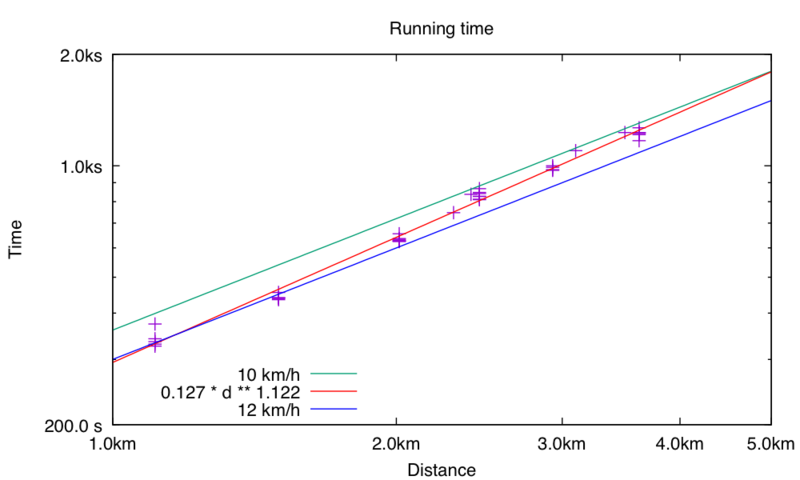 plot data and theoretical models using gnuplot. fit models to data using gnuplot. Note that these outcomes ask for observable skills, not internal states of the student’s mind—I ask that students draw schematics, not that they understand schematics, I ask that they design, build, and debug amplifiers, not that they know how to. These learning outcomes are very specific for this course—indeed, for just the most recent offering of the course, as we did not use SOT-23 components or USB-based instruments until 2017–18. They are also all evaluated repeatedly during the quarter (though some tools, such as the calipers, are only used once). In order to pass the course, students have to have done all these things, at least at a minimal level, and the student’s portfolio of work for the course shows ample evidence of their skills. I’m also convinced that students who show that they can do all these things in the course as it is structured have also met the vaguer goals of thinking like engineers, working together, and meeting deadlines. For my readers who design courses: what have you come up with for listing learning outcomes? Are there ways that I could improve the list I have? As I mentioned in Wallpaper removal, my son and I removed the ugly wallpaper from the kitchen (put up before I bought the house 31 years ago, and apparently before the kitchen cabinets were installed, so probably in the 1970s). We have now finished repainting the kitchen, and it looks a little nicer. The kitchen does still need a remodel, as there is too little counter space (and that chipped Formica), the shelving in the pantry is too deep, and the cabinets are a dark wood that does not appeal to my wife. But at least the ugly wallpaper is gone. After we removed the wallpaper and scrubbed the walls to remove all the paste, we removed all the wall anchors (except one for the clock) and used some patching plaster to fill all the screw holes in the plaster. After sanding the walls lightly, we put blue tape around all the edges—there were a lot of edges with 4 doorways, countertop, cabinets, soffit, window, and tile baseboard to mask. We then primed the walls with some leftover elastomeric primer (Kelly Moore Seal Terpolymer) that we had used on the kitchen ceiling to seal hairline cracks in the plaster. The elastomeric polymer takes a long time to dry for a primer, but provides a thick, tough layer that should prevent any hairline cracks in the plaster from propagating through the paint layer. There were two visible cracks in the plaster at two of the doorways before priming, but after priming and painting only a tiny bit of one of the cracks is barely visible—and then only when viewed at an angle. I was willing to go with my wife’s choice, as she spends the most time in the kitchen, but she offered to play Yahtzee to choose the color. My son and I thought that this was a very generous offer, as we had about a 2/3 chance of getting our choice. For once, though, my wife was lucky with her dice rolls and won the Yahtzee game, so we went with Breaktime. Sherwin-Williams claims that Emerald paint has a coverage of 350–400 square feet/gallon, and we had about 78 square feet to cover, but one quart was just barely enough for two coats. Perhaps we were putting it on a bit thinner than they suggest? This is a bit surprising, as we were using a mini-roller with a 1/2″ nap, rather than the suggested 3/8″ nap, so the paint should have been going on thicker. Perhaps we were not charging the roller with enough paint? This was our first time using a mini-roller—many of the small pieces of wall were too small for a full-size roller. The mini-roller did allow us to get closer to the edges than a full-size roller, so we were able to remove all the brush marks from the cutting-in. When my son and I were done, my wife did a little touch-up around the edges with a fine-tip artists brush as our taping and tape removal did result in a few small spots where the original color showed at the edges. The painting took less time than the wallpaper removal—even with the primer and 2 coats, though the work in both cases was spread over several days. Earlier this summer, my son started removing the wallpaper in our kitchen (put up by some previous owner, so at least 33 years old). My wife has disliked the wallpaper since we moved in, but we’ve always been a little afraid of how much work it would be to remove. He started out using a sponge and a scraper, but that was going very slowly, and I feared that we would end up having half-wallpapered walls when he went back to college, so I bought a wallpaper steamer (Wagner 715 Steamer model #1283132) and a wallpaper scoring tool. I was originally planning to order them from Amazon, but for some reason Amazon claimed that they could not ship to my address, so I ended up ordering from Lowe’s instead (the price was within pennies). The steamer is a bit of a pain to use, as it consists of a box of boiling water, a long hose, and plastic plate for directing the steam. There is no shut-off valve and the hose is a bit stiff, so any time you put the steam plate down it blows steam and hot water all over. Luckily, we have a ceramic tile floor in our kitchen, so we could put the steam plate on the floor when not using it, without risking damage to the floor. The ceramic floor also helped with picking up and mopping up all the wet, gluey mess that resulted from the wallpaper removal. I’d hate to have to remove wallpaper over a carpet or hardwood floor. The steamer takes about 15–20 minutes before the water comes to a boil and steam starts coming out the hose, but once it starts steaming, it works pretty well at removing wallpaper. We managed to remove about 10 square feet of wallpaper an hour—it would have been faster if the we had large flat areas to work with, rather than having to work around doors and kitchen cabinets. Ten square feet an hour may not be fast, but it was at least four times faster than the sponge and scraper technique my son started with. The steamer also helped in doing glue removal after getting the wallpaper off, as it saturated the glue with water very quickly. In a few places the steam got behind the latex paint under the wallpaper, and the paint peeled off the wall also. The wallpaper was behind the kitchen cabinets, which look like they were installed in the late 1960s or early 1970s, so the wallpaper was probably about 40 years old. Removing the wallpaper bits that were wedged under the cabinet edges contributed to the slowness of the wallpaper removal. One rather strange thing happened after we remove one section of wallpaper—when we turned off the LED kitchen lights, they didn’t shut off completely, but blinked at about 1 Hz, with about a 20% duty cycle. It did not matter which of the two switches we tried to turn off the lights with. If either switch was put in the unstable position halfway between the two stable positions, then the lights would go off. Our conjecture was that there was some water or wallpaper glue on the outside of the light switch, providing a high-resistance path between the two contacts on one side of the switch. The idea was that the power supply for the LEDs was seriously underpowered and slowly charged up its capacitor until the under-voltage protection circuit allowed the current through to the LEDs. The LEDs then discharged the capacitor until the voltage dropped below the under-voltage threshold and the power supply turned off the current again. We looked at the switch and it looked clean and dry, but we were convinced enough of our diagnosis that we replaced the switch (I happened to have a spare in the garage). Sure enough, when we removed the switch, dirty water dripped out of it. With the new, dry switch the LED lights worked normally. Our next step is to scrub the walls (removing some loose paint), use spackle or joint compound to fill holes in the plaster and smooth out a few places, sand the walls, reprime, and paint. Although we have some TSP (trisodium phosphate) in the garage, we are not planning to use it on the walls, as rinsing it all off may be difficult and the primer manufacturer warns against having any TSP under the primer. We’ve not decided whether to use a TSP substitute or just clean the walls with ammonia and water, relying on sandpaper to degloss any paint that is there. I’m hoping that we can get most of the wall prep done in the next week, so that we can get the painting done before my son goes back to college in 2½ weeks. 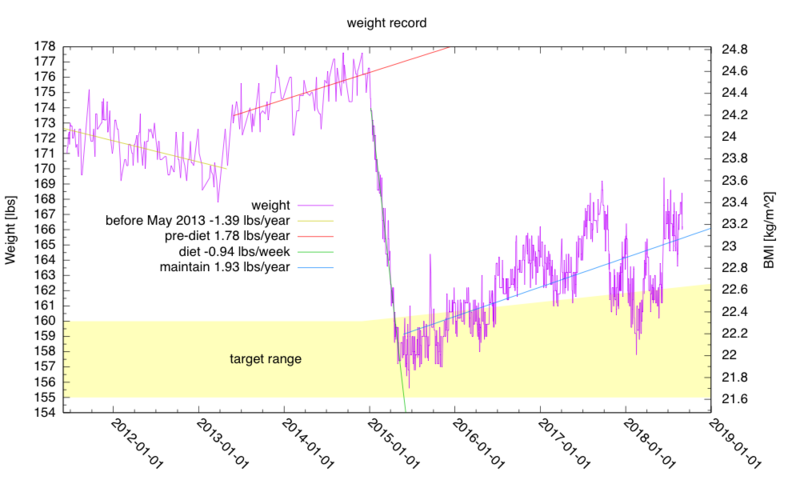 I have not been able to keep my weight within my self-imposed target range for the past several months. 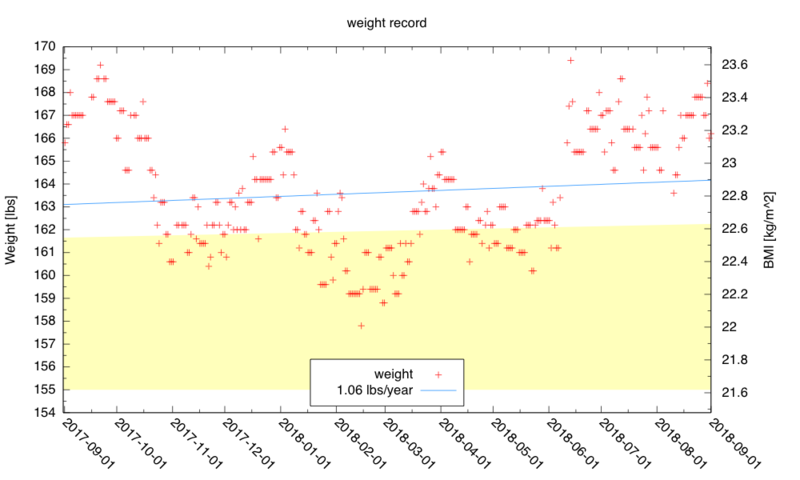 Summers seem to be bad for my weight, as both last summer and this summer were high-weight points for the year. I think that part of the problem with summer weight is that I stay home more, which means much less exercise and more snacking. In August 2018, I only averaged 1.23 miles/day on my bicycle (under 30% of my usual exercise). 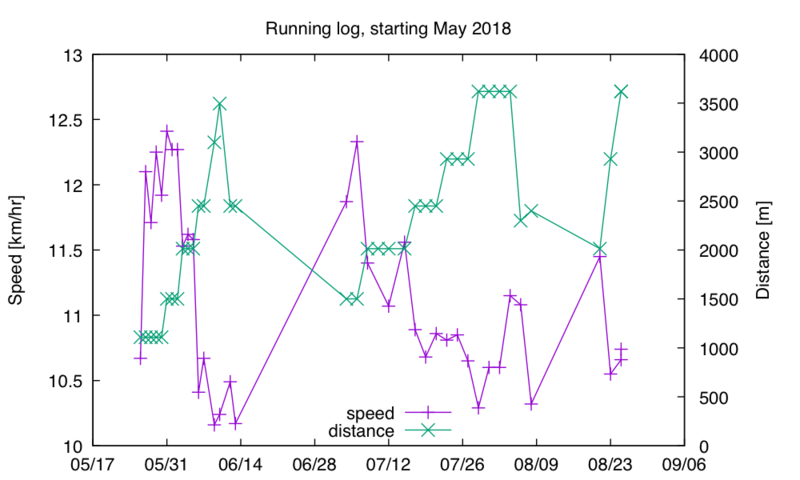 Although I restarted running at the beginning of July, I did not not run much in August, because I got a long-lasting cold on my trip to Boulder. I was there to visit my Dad in the nursing-home/rehab-center where he was recovering from a stroke that caused him to lose almost all sensation on the left side of his body. He has been continuing to improve, but we’re going to have to move him from an independent-living community to an assisted-living community, because he still needs at least minimal assistance for many activities. There was a long break in my running in August, because of getting a long-lasting cold on my trip to Boulder, CO. I’m only just starting up again. I didn’t do Bike Santa Cruz County’s 12km run on 26 August 2018—not even the 4km short run, as I was still feeling the effects of the cold, had not gotten my training up to doing longer runs, and couldn’t see the point of biking over to Wilder Ranch to do just a 4km run at low speed. I’m still running fairly slowly—between 10 and 12 km/h, which translates to a mile pace of 8:00 to 9:40, depending on distance (8:22 at 1 mile).